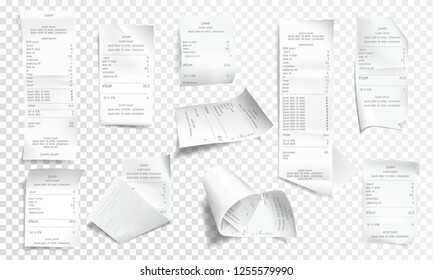 47862 place | Vector illustration in rank M-rank: Vector realistic receipt collection, white paper with payment isolated on transparent background. Creased financial printout for shop, store. Retail bill, rumpled commercial check or invoice. Vector realistic receipt collection, white paper with payment isolated on transparent background. Creased financial printout for shop, store. Retail bill, rumpled commercial check or invoice.